The onward march of the Mariinsky’s own label continues with this, their first opera to be released on DVD. If this keystone Italian work, sung by a Russian cast, seems a bizarre or off-putting choice then be prepared to put aside your doubts because, for me, it succeeds on pretty much every front. The Mariinsky is one of the few houses these days that possesses a true ensemble at its heart, and it is pretty astonishing that they could so successfully cast Attila with singers who are all Russian. True, some of them have also made their names elsewhere, but they all owe a debt to the Mariinsky Theatre in some respect and their coming together for this opera is a triumph. 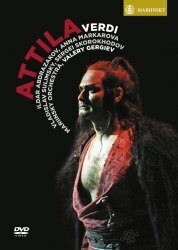 Without a great bass in the title role there is no point in even considering a production of Attlia, but happily Gergiev has found one in Ildar Abdrazakov. He is thrilling throughout the set, worthy of comparison with the very finest basses who have taken this role on record before him. His tone is lyrical and infinitely musical, but he manages to bring drama of the highest intensity to the character, especially his bloodthirsty utterances in the Prologue. He is also genuinely commanding at the moments where he has to be. His account of the dream in Act 1 is fantastic, both in its vocal acting and its sense of the long Verdian line which he spins in what seems to be an effortless manner. His change of heart before the Pope is meltingly lyrical in a way that is exceptionally sensitive. In short, he has the full measure of the role and can easily bear comparison with other recorded Attilas, such as Ramey or Raimondi. Every bit as authoritative is the bass-baritone of Vladislav Sulimsky, who invests the character of Ezio with more gravitas than you will hear elsewhere. There is notably more depth to his voice than in that of, say, Milnes on the Gardelli set and, exciting as is his duet with Attila in the Prologue, his singing of Ezio’s aria at the start of Act 2 knocks on the door of greatness, elevating this music into territory that makes you think of the composer in his Trovatore years. In her armour and breastplate Anna Markarova looks as though she should be singing Brünnhilde, and her entrance aria does, indeed, have the heft (and subtlety) of a Valkyrie war-cry. However, she mellows her tone to give a very moving account of her Act 1 aria and she reveals herself to be a Verdi soprano of rare distinction and versatility, not just an inveterate yeller. She displays moments of lyricism while retaining the ability to cut through the texture of the big ensembles, and she adds a distinctive flash of colour to the great concertante scenes. I also loved the sound made by tenor Sergei Skorokhodov, who produces a remarkable blend of Italianate tone refracted through Slavonic darkness. His aria and cabaletta at the end of the Prologue brings down the curtain in exhilarating form. He proves every bit the match of Markarova in their fantastic Act 1 duet, one of the highlights of the set because it matches two fantastic vocal talents who are inspired to strike sparks off one another. With such an excellent quartet of soloists it’s hard for the set to go wrong, and their great quartet in the third act is a fantastic display of sheer good singing, but what of the others? Well, the chorus sing at their usual excellent standard, but you need to put some effort into forgetting that they’re Russian: when the Aquileians first appear, for example, they sound like a chorus of Orthodox monks with their guttural consonants. However, their sound is always exciting, and the same is true for Gergiev himself, who shows himself to be surprisingly adept at early Verdi, mainly because he doesn’t try and over-complicate things. Instead he isn’t afraid to let rip (not a technical term!) when he needs to and he lets the orchestra go for it in their rum-ti-tum moments. Consequently, the cabalettas are particularly exciting because everyone involved, in the pit and on the stage, is encouraged to give it their all and to hell with the consequences. In this he has a touch of Muti about him without that conductor’s occasional pretences. He isn’t afraid, for example, to allow Foresto his unwritten high note at the end of the Prologue, something that would never have been allowed at La Scala. He prolongs the big chords that end acts in a way that elongates the drama and exhilarates the listener. Overall I found him an exciting, enervating presence. I can understand some objecting to his lack of Italianate style and phrasing, but for me that loss was more than made up for by the sheer excitement of his reading. The production is a traditional, stand-and-deliver affair complete with togas and bloody swords, which does the opera no harm at all. The technical side of things is also very good, with excellent picture quality and good surround sound that displays the sweep of the drama while allowing individual voices to come to just the right levels of prominence at the right times. It’s a shame that there are no extras, but that doesn’t detract from what remains an excellent performance, and an exciting way to launch the Mariinsky’s series of opera DVDs. It’s a completely different experience to Muti’s La Scala recordings, both on CD and DVD, but it’s worthy to stand alongside them. Don’t be scared to give it a try.